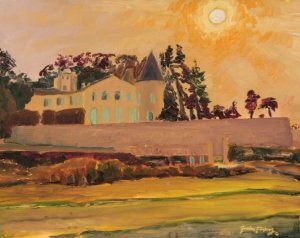 Wine art and a spontaneous landscape painting of Château Lafite Rothschild ~ sunset 20th August. Bordeaux, “Famous Wine Villages of Bordeaux” series , available including for exhibition. Wine art by Gordon Frickers, measuring 40 x 50 cms (15¾” x 19¾”), oils, available, £950.00, ex frame ex studio. Saw this sight, had no idea which chateau it was, loved the scene and the extraordinary light that evening. This was painted entirely on location in one inspired hit. This is a painting that flagrantly breaks the rules of painting. Château Lafite Rothschild is one of only ten Châteaux listed as the very best in France by the Imperial classification of 1855, a classification still in use today. Since 1855 only one other chateau has won the right to added to the original 9 at the top of the list.